I think of Clemson as a place that is always building. I’m not talking about the construction that has been completed at Douthit Hills and continues with the College of Business, although those are important as well. Clemson University builds many other things that are highlighted in this issue. This year, over Homecoming week, our students completed the 26th Habitat for Humanity home in the 25th anniversary year of the program on campus. The education our students receive is broader than the books they read and the lectures they hear. They also learn what it means to give back to the community in which they live. In the 10th year of the ClemsonLIFE program, we celebrate building futures at Clemson. 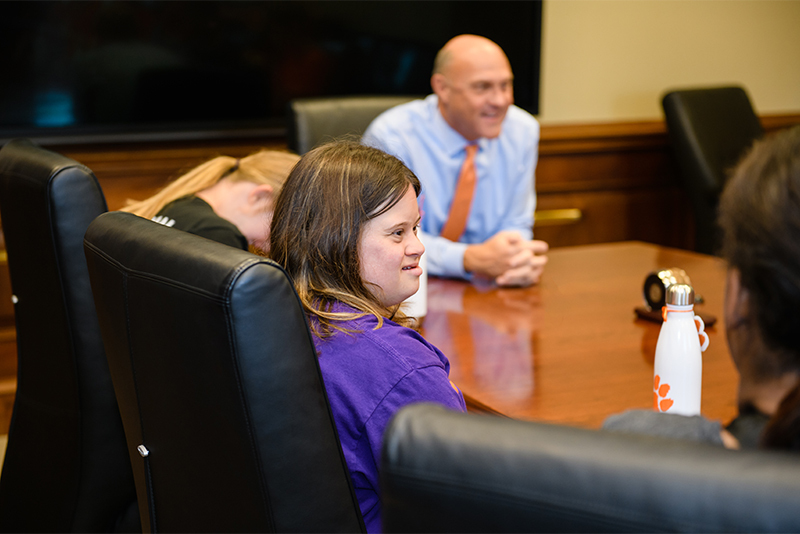 This program has opened a world of opportunities to students with intellectual disabilities and enabled them to live more independent, productive lives. Our ClemsonLIFE students have contributed a tremendous amount to the University community as they live, study and work on campus. You can read more about the program on page 22. Clemson is building futures in Charleston as well. In partnership with a local nonprofit and several corporations, we’re offering coding classes and other opportunities to young people in one of the most economically challenged neighborhoods in the state in an effort to help those students break the cycle of poverty and see the potential for a different kind of future. And Clemson alumni are active in the world, building bridges for peace and understanding and fostering international relationships. The story on page 30 highlights Kristie Kenney ’77, who has had a distinguished career in the U.S. State Department as an ambassador to Ecuador, the Philippines and Thailand. She is committed to mentoring students and junior foreign service officers, building the next generation of diplomats and American leaders. I’m proud to represent a University that produces graduates like her. While the physical building projects at Clemson may be temporary, the other building we do will continue and will have results that resound through the years. Join me in recognizing our students and alumni who are building a better world for us all.